I'm back! I have my Orange nails for the 31 Day Challenge to share with you today. 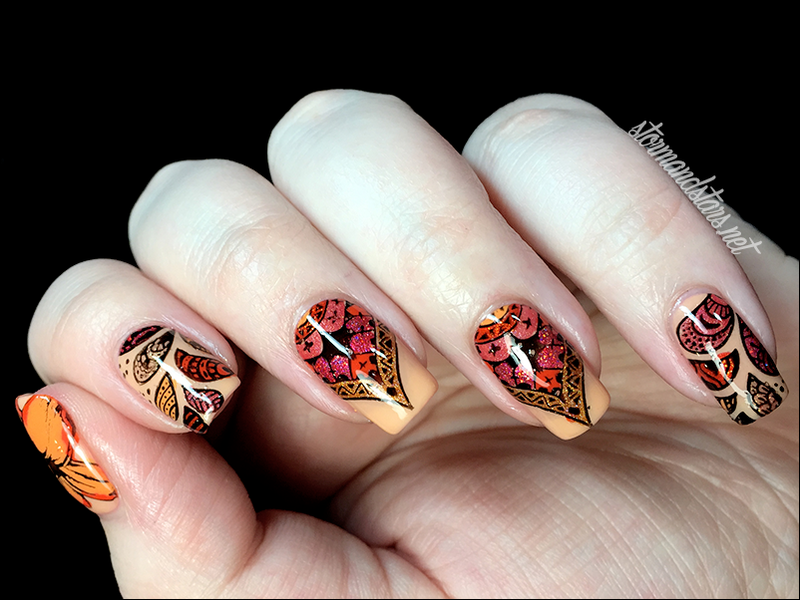 If you don't know what the 31 Day Nail Art Challenge is you can head over to the FAQ over at Chalkboard Nails. She does a great job explaining everything. Now, shall we get right into orange? I got the most exciting package in the mail Monday, it was my Uber Mat from Uber Chic Beauty!! (OMG Yay!!!) Well of course, I tried to do decals right away the first night I got it. 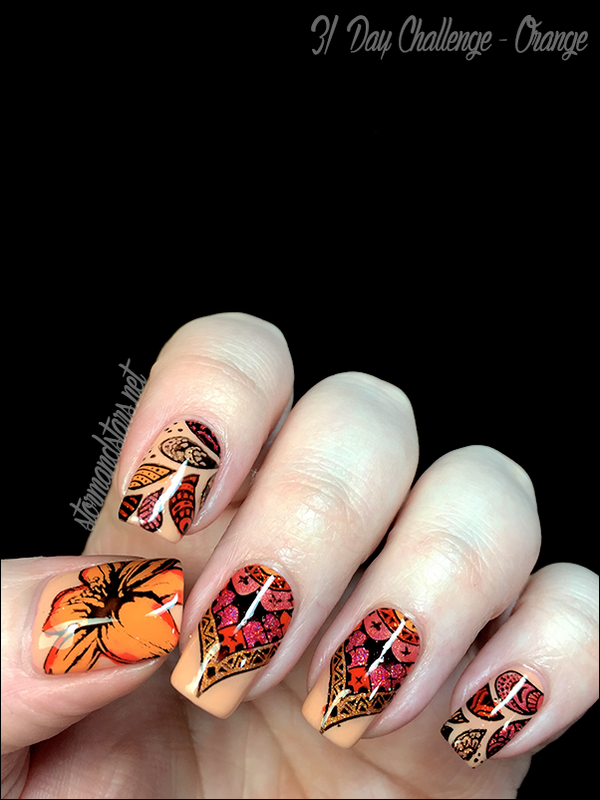 I already had my red nails done, so I decided to try out some decals for this prompt. I failed... miserably. The decals were crunchy and thick, they wouldn't lie flat on my nails and it looked completely awful. So of course I went to my amazing friend Donna @workinggirlnails and she suggested some things. I tried again and this time I changed to a non fast-dry topcoat and I made them thinner. Success! Wanna see? Of course you do, that is what you're here for right? I had a really hard time coming up with something for orange since it isn't a color I wear a lot so I asked my girlfriend for help coming up with something. 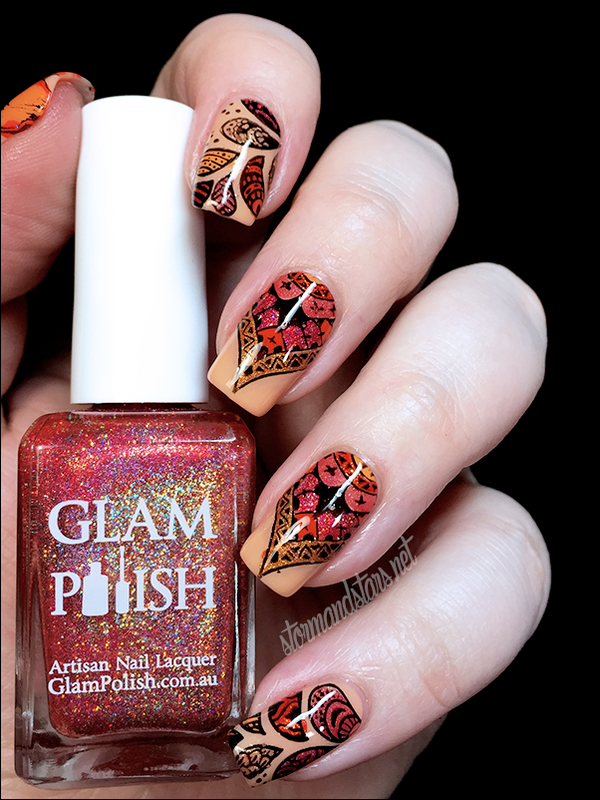 She suggested Tiger Lillies, and when I saw that I have a stamping plate with one on it I knew that would be perfect as an accent nail. I used a decal technique by laying down a coat of Wet n' Wild clear polish on my Uber Mat for each nail and then stamping over it once mostly dry with Cult Nails Nevermore. 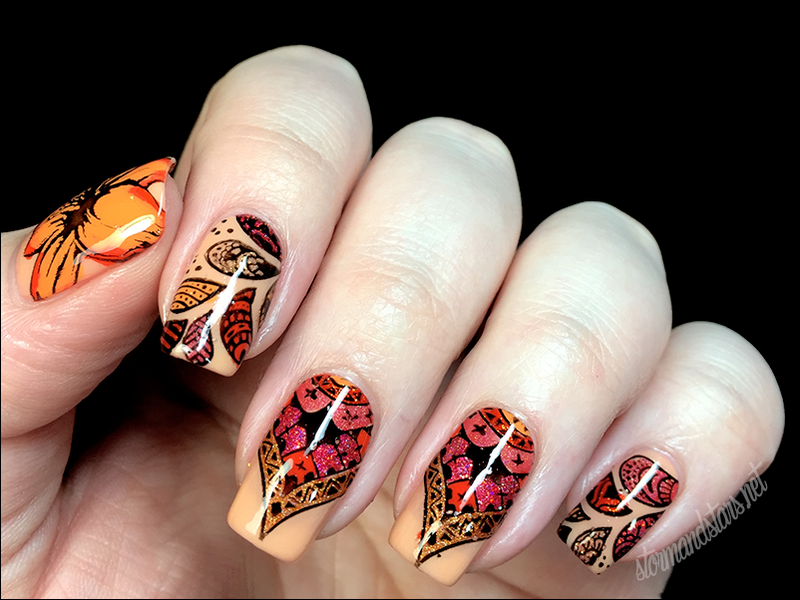 I used Uber Chic Beauty plate 1-02 for the Tiger Lilly on my thumb and MoYou London Doodles 07 for the other 4 nails. 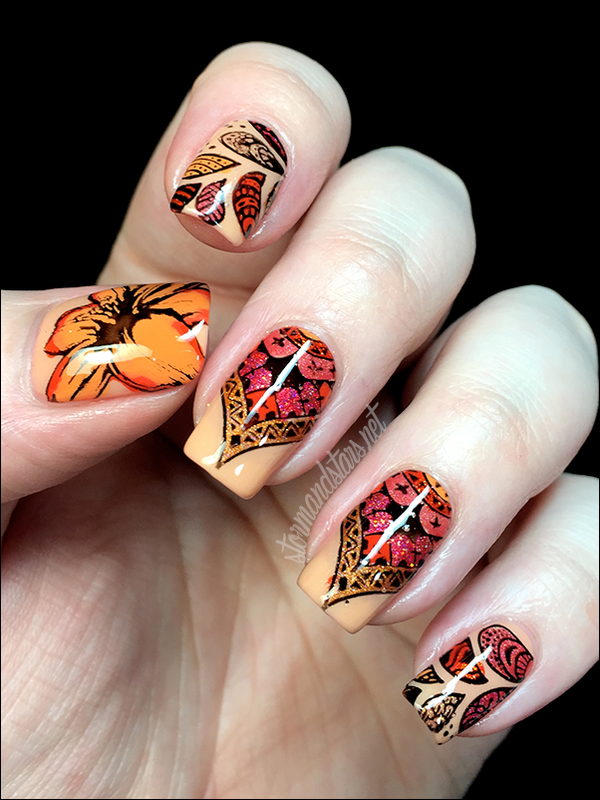 After I stamped I used various orange polishes to fill in the stamped design on the mat and then I left it to dry for a bit. In the meantime, I painted my nails using three coats of Jolie Polish Stop Coral-ing Me Around and then used a fast dry topcoat to finish them off. Once my decals were dry I very very carefully peeled one of them off my Uber Mat and cut out the part that I wanted on my nail. I put a thin coat of topcoat on my nail and then laid down the decal with the shiny side down so the black stamping showed with the colors behind it. I patted it down on my nail so that it adhered and then cleaned up around the nail with acetone. Once the decal was in place, I used my favorite topcoat to go over the whole thing and seal it in and make it super shiny. I repeated these steps with each of my nails to complete the look. So what do you think? I think my middle nails remind me of some sort of fancy Indian dress. I love them so much. I'll see you all tomorrow for the next prompt! these nails are amazing!! love the contrast against the pattern and you've inspired me to create something like this!! Thank you! I'd love to see it when you do! The decal Stamping is perfect - wunderful. These are perfect. I absolutely love this mani. This is why I love the 31 DC, finding new accounts to follow! Thank you a lot!! Its so much fun looking through to see what other people come up with! This is so so so amazing! I love it to death! Thank you Amy! I'm so glad you do!